Boxwood shrubs are a common choice in landscaping. The Buxus species has been used in formal gardens for hundreds of years. Many historical gardens are known for their boxwoods. It truly is one of the most versatile landscape plants. The Boxwood plant can be used by itself or with many other plants to form a foundation planting. It can be used to enclose or define an area, to separate one space from another, or as a screen. It makes a wonderful background to more colorful plants. It can frame a view or create a framework, as in a formal garden. 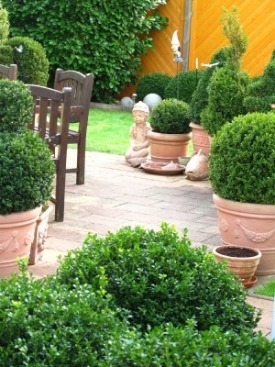 Use the boxwood shrub to outline a walkway, a border or terrace. Put it in a container or in the ground. 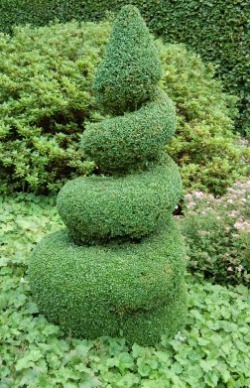 It can also be shaped into topiary. Boxwood shrubs come in many forms. Some varieties form columns, others form globes. Some lie on the ground in a prostrate manner. Still others form a weeping shape or pyramids. Some grow fast and others grow more slowly. Most have tiny foliage and a dense texture, though there is some variation with that as well. All of these characteristics have helped make boxwood a popular landscaping plant. All that being said, there are also those who don't care for boxwood for one reason or another. Plant boxwood shrubs in well-drained soil. They do best in a partial shade environment, though some will tolerate full sun if it isn't too strong. Don't plant them anywhere they will get dripped on or stays wet. When planting your boxwood, make sure you dig your hole twice as wide as the root ball but don't dig it any deeper than the roots. Fill in around the root ball with a rich loamy soil to encourage the roots to grow quickly. Don't plant the boxwood any deeper than it was in its pot. Deeper planting will cause stress to the plant and may even kill it. Firm the soil in and water it well. Keep to a regular watering routine that moistens the entire root ball will help with even growth and health. Light watering will result in plants with shallow roots that will get easily stressed in the heat. Add mulch to keep the roots moist and cool. Pine needles, wood chips or bark all work well. Add more at least on an annual basis to keep the roots protected. Fertilize your boxwood about twice a year during the active growing season. To get the optimum fertilizer, do annual soil tests in the fall so you know what they are lacking. Don't let any fertilizer get on the leaves and make sure to water thoroughly after feeding. Most people prune their boxwood shrubs to keep them in a shape suitable for their landscape. Shearing removes all of the latest growth in a uniform manner. This increases the density and compactness of the plant. By shearing for the first few years after planting, your boxwood will develop more branching and thickness. Once they have reached the desired density, shearing can be done only to maintain the form you want. If you shear too much, the outer layer will be so thick that the inner branches are deprived of light, causing them to drop their leaves. Don't shear in late summer as any new growth won't have time to prepare for winter. Pruning only removes certain branches. You will need to prune out any areas that are dead, dying or diseased. Stray branches that don't conform to the desired shape are also pruned. Older boxwoods may need some of the older branches pruned so light can reach the new inner growth. Don't plant too many things close to the boxwood shrubs. They have shallow roots, and cultivating too close to the shrub may disturb them. If you are using boxwoods to edge your flower beds, be especially cautious that the roots are not disturbed. This can cause die off or problems with portions of the plant. Most boxwoods are propagated from cuttings, although they can be started from seed as well. Starting them from seed allows more variation in form. You don't know if you will get a pyramidal, globe or dwarf variety. The foliage may be tiny or medium in size. This is why most are done from cuttings. You know you will get the same growth habit as the parent plant. Boxwood shrubs are prone to winter damage. Reddish brown, yellow or grayish foliage has been damaged. Branches may die, especially in the middle. Keeping your boxwood healthy before winter sets in is the best way to prevent damage.